Is a custom label as important as the product you manufacture? Although the cost of your part may be higher, custom labels provide significant value. An inferior label on a perfectly good part often spells trouble. United Ad Label understands the importance of labels in the manufacturing industry. We’ve provided manufacturing companies, both large and small, with a full line of stock labels for almost 60 years. But sometimes you need something different than the item in the catalog. So now, we’ve made it easy for you to get both stock and custom labels online. Using our Custom Label Builder (CLB) you can create the the exact label you need. One that enhances your product, not interferes with it! Avoid the treasure hunt of incorrectly labeled parts and materials. Add numbering and barcodes to get the parts when and where you need them. 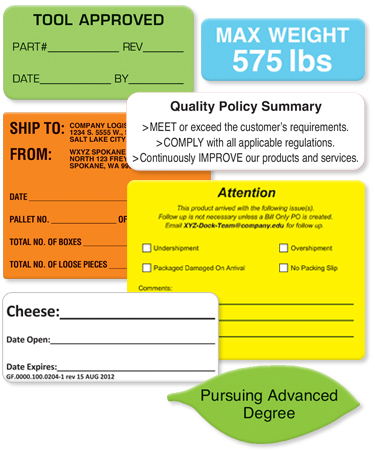 Eliminate losing critical information on manufacturing equipment labels. Add a surface treatment to ensure that regular cleaning or abrasions won't wipe it away. Segregate and control questionable parts and batches. Adding serial numbers to bins helps you to identify and inspect the parts at a later date. Direct shipments to the right location. Auxiliary shipping labels with specific instructions like Use Back Loading Dock or For Customer Pickups, route shipments to the right location. Meet safety requirements for non standard applications. Develop custom GHS labels using the proper signal word and mandatory GHS pictograms and add customized storage and handling information. Although business needs are constantly changing, labels have allowed manufacturing companies to develop and maintain effective processes for years. The Custom Label Builder makes it easier than ever to order custom labels for your manufacturing operation. Try it today!